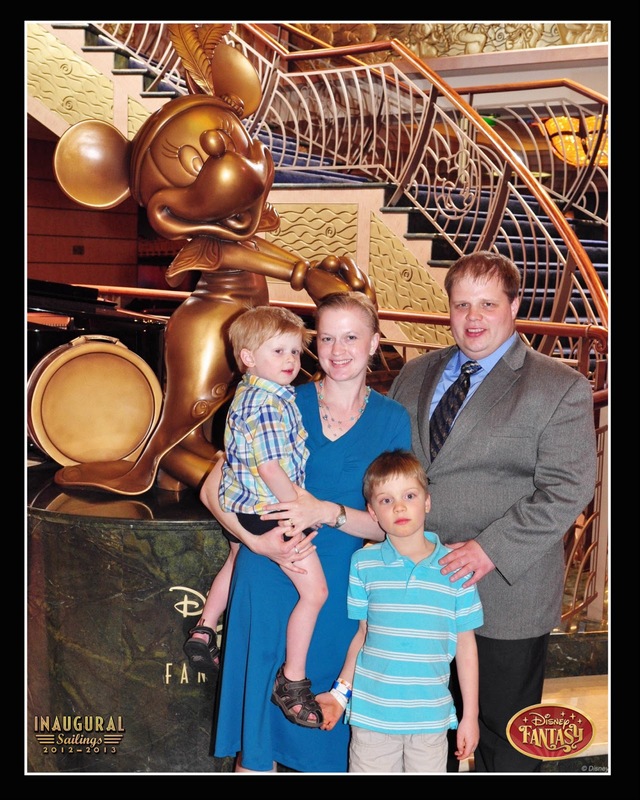 The Disney Fantasy has a wonderful, beautiful grand lobby. 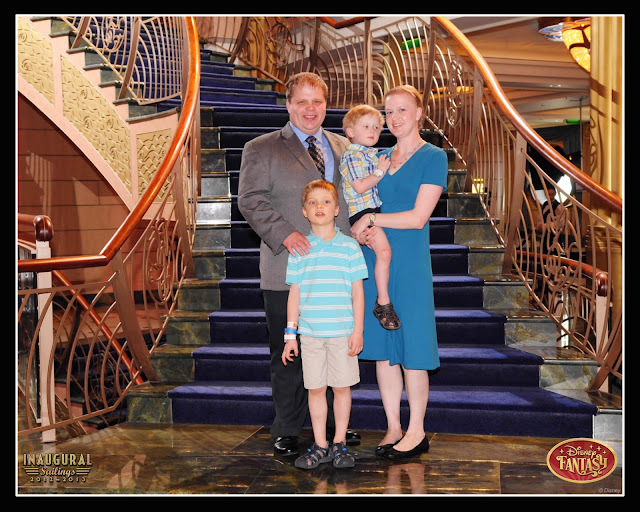 It was one of my favorite places on the whole ship! My favorite thing about the grand lobby was this fabulous peacock chandelier. (The ship has an elegant peacock theme throughout.) This chandelier was thebomb.com. I've been wanting to use that hilarious phrase for a long time in one of my blog posts. The peacock chandelier is worthy of it! Also in the lobby there was a large spiral staircase with a statue of Minnie Mouse (wearing a peacock headband and an evening gown) at the foot of the staircase. I bought a replica of the statue and it's on our mantel. It's a nice reminder of the ship and of the good times we had there. I took the pictures above at night when the lobby was pretty empty. Usually it's a pretty happening place with lots of people around, especially in the evenings. Note the huge peacock carpet. I loved the blues and greens in it. There are two Minnies in the picture below; do you see them both? The staircase and statue were a popular place to have pictures taken. There were families that would dress in nice identical outfits just for their photos. Our family pictures there weren't that fancy and they came out okay. The boys weren't really in the mood to have their pictures taken (as you can see), but we had to try anyway, and I'm glad we did! I thought the two guys who photographed us were cute. I snapped their picture from the landing upstairs while we were waiting in line to meet a character. Hee hee hee. Also happening in the evenings in the grand lobby was live entertainment. Very classy! In conclusion, all I can say is, I want to go back!